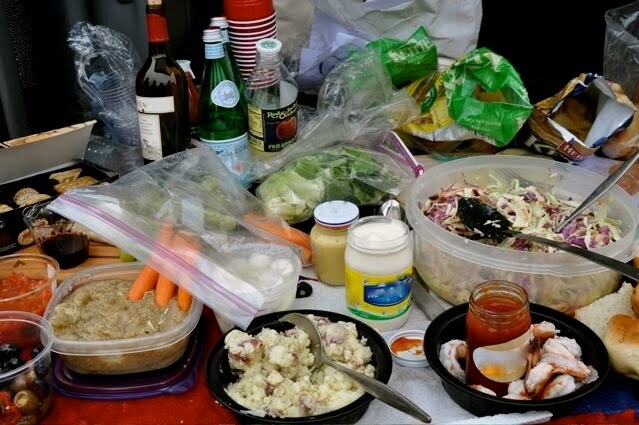 Fall is a great time for tailgate picnic fare. 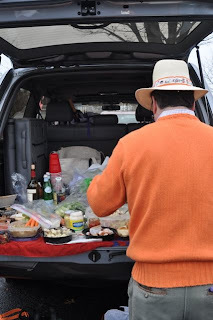 On Saturday, Henry and I hosted a tailgate at Princeton for the 132nd Yale Vs. Princeton Football Game at Princeton (Princeton Tigers 24 - Yale Bulldogs 17). With cabbage, carrots, potatoes, eggplant all in season, I whipped up a few locavore and crowd pleasing dishes which all survived the car trip -- potato salad, coleslaw and roasted eggplant dip. Friends and family joined us including a bunch of my nieces classmates plus Sandra, Jim, Wendy and Casey (Princeton '11) Van de Walle, Rob ('77) and Cindy Dickey, Bob Babecki ('77), Jose Pincay ('77) and Lucy Neis, Maddie Kate and Peter Kaufman (Yale '75), Harry Hall (Yale '75), Virginia ('10) and Carolyn Maloney, Suzanne Christen, Scott and Alex Park. I cooked everything ahead of time and stored it all in food saver dishes. 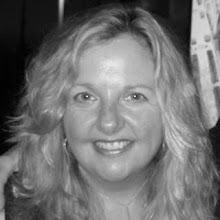 Just before getting in the car for the drive to Princeton, I packed everything into a few insulated bags with ice packs. 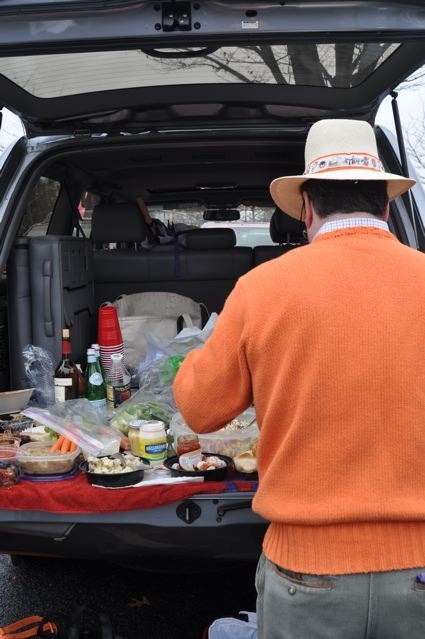 The SUV hatchback covered with a festive beach towel made the perfect buffet table (next time I'll use a Princeton Tigers beach towel). Prepare dressing in a measuring cup and set aside. Boil the cut potatoes until just cooked through. Do not overcook. Drain and hot toss potatoes with diced celery and vinaigrette. Serve warm or at room temperature. Salt and pepper, to taste. Preheat oven to 400 degrees. Lightly brush olive oil onto a roasting pan. Prick eggplants with a fork 3-4 times. Wrap garlic head in aluminum foil. Roast eggplant and garlic for 35-45 minutes until soft. Let cool. Peel eggplant and garlic. Add eggplant, garlic, lemon, olive oil and salt and pepper to a food processor or blender. Process until smooth and store in the refrigerator. Serve with fresh local carrots or pita bread. Cut the cabbage into 2 x4 inch pieces that can fit into the mouth of the food processor discarding the thick core of the cabbage and any wilted leaves. Fit the food processor with the slicing blade and shred the cabbage. Transfer shredded cabbage to a large mixing bowl. Change the blade to the grater blade to grate carrots and transfer them to the bowl with the cabbage. Core the apples and shred using the grater blade and transfer the shredded apple to a separate bowl. Add lemon juice to the shredded apple and stir (this will keep the apple from turning brown). Let apple sit for several minutes before adding to the cabbage mixture.Rinse the food processor bowl and dry. Add all of the dressing ingredients and blend in the food processor until smooth. The dressing should be relatively thin. Toss vegetables and salad dressing and let marinate for several hours in a covered bowl in the refrigerator.